Voluntary exercise has been reported to reduce depression- and anxiety-like behaviors in an animal model of depressive disorder (DD). However, the degree of appropriate voluntary exercise to improve depression-like behavior remains unknown. In the present study, we examined the effects of two different terms of voluntary exercise, short (3 days)- and long (14 days)-term freewheel running, on depression-like behavior and new cell proliferation in the dentate gyrus (DG) in a DD mouse model generated by exposure to chronic mild stress (CMS), and then compared the antidepressant effects with those of ketamine. Freewheel running was used as the voluntary exercise. DD model mice, which were generated by subjecting mice to CMS for 4 weeks (CMS mice), were allowed free access to a running wheel for 3 or 14 days. Next, we examined the effects of voluntary freewheel running and ketamine on depression-like behavior in CMS mice using the forced-swim test (FST). New cell proliferation in the DG of the hippocampus was immunohistochemically analyzed by enumerating the number of 5-bromo-2’-deoxyuridine (BrdU)-labeled cells following administration of BrdU (100 mg/kg, twice a day for 3 days). Short-term freewheel running showed an antidepressant effect in CMS mice in the FST, which was comparable to that of ketamine, but did not affect new cell proliferation in the DG. In contrast, long-term freewheel running increased new cell proliferation in the DG, but did not improve depressive behavior in the FST. Short-term but not long-term voluntary exercise in CMS mice resulted in improvement of depression- like behavior similar to antidepressant ketamine, and appeared to be independent of exercise-induced stimulation of new cell proliferation in the DG. Exercise is considered to increase resistance against stress-induced psychiatric disorders such as anxiety and depression. Indeed, it has been reported that physical exercise effectively improves depressive symptoms in patients with depressive disorder (DD) , intact mice [2,3], and a rodent model of depression . In addition, chronic treatment with the antidepressant fluoxetine or voluntary wheel running has been reported to stimulate neurogenesis in the hippocampal dentate gyrus (DG) via enhanced progenitor proliferation in intact mice [5,6], suggesting that the antidepressant effect of these treatments might be involved in the stimulation of hippocampal neurogenesis . Voluntary wheel running in DD model mice has been reported to improve depression-like behavior . However, Hutton et al. reported that voluntary wheel running alone recovers neither depression-like behavior nor decreased neurogenesis in mice exposed to chronic stress. Thus, the appropriate degree of voluntary exercise to improve depression-like behavior and its relationship with new cell proliferation in the hippocampal DG remain unknown. Therefore, we planned to explore the antidepressant effects of two different degrees of voluntary exercise, short- and long-term, in regard to the difficulty of the exercise contents and the proliferation of granule cell precursors after the two different degrees of exercise. At the same time, we attempted to compare the efficacy of antidepressants with those of the two exercises and a single administration of an antidepressant agent, ketamine. In the present study, we examined the effects of two different terms of voluntary exercise, short (3 days)- and long (14 days)-term freewheel running, on depression-like behavior and new cell proliferation in the hippocampal DG and compared them with the effects of a single administration of ketamine in DD model mice (mice exposed to chronic mild stress [CMS]). We report that light voluntary exercise might be effective for the prevention of stress-related disorders such as anxiety and depression and could be applied in patients with DD to maintain mental health without the need to depend on clinical medicine. Male C57BL/6 mice (6–7 weeks old) were maintained under controlled temperature (22 ± 2°C) and humidity (35 ± 5%) with a 12-h light/12-h dark cycle (lights on at 0700 h), and allowed ad libitum access to pellet food (Crea Japan, Tokyo, Japan) and water. All procedures for the care and use of experimental animals were approved by the Animal Research Committee at Obihiro University of Agriculture and Veterinary Medicine and were conducted in compliance with the Guiding Principles for the Use of Animals in Toxicology adopted in 1989. Mice were divided into CMS and non-stressed (NS) groups. To generate the DD animal model, mice were subjected to two randomly selected mild stressors (inverted day/night light cycle, water deprivation, food deprivation, 45° tilted cage, wet bedding, removal of bedding) during a 12-h period per day for 4 weeks. These CMS mice were allowed free access to a running wheel for 3 or 14 days after the last stressor. Depressionlike behaviors in the CMS mice were confirmed using the forced swim test (FST) and the sucrose preference test. MS and NS mice were administered once saline vehicle or antidepressant ketamine (5 mg/kg, i.p., Daiichi-Sankyo, Tokyo, Japan) at the last day of 4-weeks-CMS or 4-weeks-NS. The FST was performed as previously described . Briefly, mice were placed in a 5000 mL Pyrex glass beaker (height: 256 mm, diameter: 182 mm) containing 4000 mL of water at 26 ± 1°C for 6 min. The water was changed between each subject. All test sessions were recorded with an overhead color CCD camera. Data were stored and analyzed, and then scored by an observer blinded to the groups. The latency period until the first appearance of immobility (immobility latency) and total immobility time during the last 4 min of the 6-min trial (immobility time) were measured. The sucrose preference test was conducted using a two-bottle test. To habituate to the 1% sucrose solution, individual mice were placed in the cage equipped with the two bottles, containing 1% sucrose solution and water, and allowed free access to the 1% sucrose solution and/or the water for a total of 48 h. To prevent potential drinking location preference, the position of the bottles was changed 24 h after starting habituation. After a 12-h water-deprivation period, each mouse was returned to its home cage equipped with the two bottles and allowed free access to these solutions for 1 h. Sucrose preference was determined by calculating the percentage of sucrose solution ingested relative to the total amount of both sucrose solution and water consumption. Mice were allowed free access to a running wheel in their home cages (RW-15; Melquest, Toyama, Japan) for 3 or 14 days prior to behavioral tests. Data were stored on a personal computer and analyzed using software (CIF3WinMini4; Melquest, Toyama, Japan) that measured the distance that each mouse ran every day. For nonrunning control mice, the wheel was locked to prevent running. Following the voluntary wheel running or administration of the antidepressant agent, mice were injected with BrdU (100 mg/kg in saline containing 0.007 N NaOH, i.p. ; Calbiochem, San Diego, CA) twice a day (0800 and 1700 h) for 3 days. Twelve hours after the last injection, the mice were anesthetized with Avertin®(0.36 g/ kg) and transcardially perfused with heparinized phosphate buffered saline (PBS), followed by 15 mL of 4% neutral-buffered paraformaldehyde solution. The brains were dissected and post-fixed with 10% neutral-buffered paraformaldehyde solution. Post-fixation, the brains were cut on an oscillating tissue slicer (Linear slicer Pro7; Dosaka, Kyoto, Japan) into 40-μm thick sections throughout the DG and cerebellum. For BrdU immunohistochemistry, the sections were permeabilized using 0.5% (v/v) Triton X-100 in phosphate buffered saline (TPBS) for 1 h, incubated with Pronase E (3 μg/ml in PBS; Sigma, Saint Louis, MO) at 37°C for 20 min, denatured in 2 N HCl for 10 min, rinsed twice in PBS, blocked in 2.0% normal rabbit serum for 1 h, and incubated for 36 h at 4°C in sheep anti- BrdU polyclonal antibody (1:10,000 dilution in TPBS; Exalpha Biologicals, Boston, MA). The sections were rinsed in TPBS and incubated for 2 h in biotinylated sheep secondary antisera (1:200 in TPBS; Vector Laboratories, Burlingame, CA). After rinsing in TPBS, the sections were incubated for 1 h in avidin-biotin-horseradish peroxidase (1:50 in TPBS; Vector Laboratories), rinsed in PBS, and reacted for 10 min in 0.02% diaminobenzidine with 0.02% H2O2. After rinsing in PBS, the sections were mounted and coverslipped under 50% glycerol in PBS. The number of BrdU-labeled cells was determined by counting the cells in five DG sections obtained from the dorsal hippocampus of each mouse using light microscopy (BH-2, Olympus, Tokyo, Japan; 20 × objective lens). The five sections comprised every third section of a series of 13 sections from the DG (dorsal hippocampus: positioned 1.46–1.98 mm posterior to the bregma). The mean number was calculated by averaging the number of BrdU-labeled cells counted from the five sections. Between-group comparisons were analyzed using the Student’s t-test. Multiple group comparisons were assessed using one- or two-way analysis of variance followed by the Bonferroni posthoc test. Statistical differences were considered significant at p < 0.05. All statistical analyses were performed using SPSS 16.0 software (SPSS Japan Inc., Tokyo, Japan). To verify the induction of depression-like behaviors following CMS exposure, we subjected the mice to the FST and sucrose preference test to assess their behavior. As shown in Figure 1A and Figure 1B, a significant decrease in body weight and sucrose preference was observed in CMS compared with NS mice. Moreover, CMS mice showed a significant increase in immobility time and a significant decrease in immobility latency compared with NS mice in the FST (Figure 1C and Figure 1D). Because CMS mice displayed depression-like behavior, we next examined the effects of voluntary freewheel running and an antidepressant agent, as an object of comparison, on depression-like behaviors in the CMS mice. 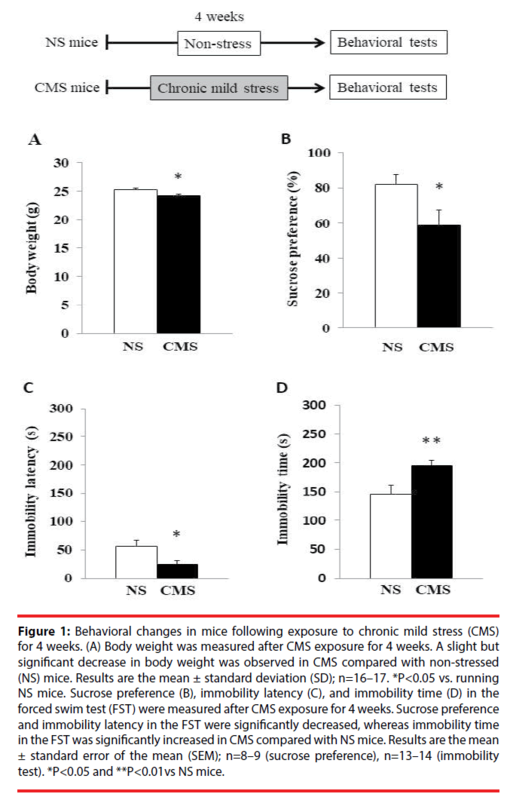 Figure 1: Behavioral changes in mice following exposure to chronic mild stress (CMS) for 4 weeks. (A) Body weight was measured after CMS exposure for 4 weeks. A slight but significant decrease in body weight was observed in CMS compared with non-stressed (NS) mice. Results are the mean ± standard deviation (SD); n=16–17. *P<0.05 vs. running NS mice. Sucrose preference (B), immobility latency (C), and immobility time (D) in the forced swim test (FST) were measured after CMS exposure for 4 weeks. Sucrose preference and immobility latency in the FST were significantly decreased, whereas immobility time in the FST was significantly increased in CMS compared with NS mice. Results are the mean ± standard error of the mean (SEM); n=8–9 (sucrose preference), n=13–14 (immobility test). *P<0.05 and **P<0.01vs NS mice. In the following experiment, to assess the direct effect of voluntary exercise on depression-like behavior, we chose to perform the FST because this test can readily evaluate depression-like behavior within 10 min immediately after voluntary freewheel running. CMS and NS mice were administrated saline or the antidepressant ketamine (5 mg/kg, i.p.) once on the last day of 4-weeks-CMS or 4-weeks-NS. Ketamine is well known for having fast-acting antidepressant responses in DD patients  and DD model mice  under a single sub-psycho-mimetic dose. The FST was performed to assess depression-like behaviors in mice 24 h after ketamine administration. CMS mice administered saline showed a significant increase in immobility time compared with NS mice administered saline. However, CMS mice administered ketamine showed a significant decrease in immobility time compared with CMS mice administered saline (Figure 2B). On the other hand, no significant between-group differences were observed in immobility latency (Figure 2A). These results suggest that ketamine improves depression-like behavior in CMS mice. Figure 2: The effect of the antidepressant ketamine on depressive behavior. CMS and NS mice were administered saline vehicle or ketamine (5 mg/kg, i.p.) once on the last day of 4 weeks-CMS or 4-weeks-NS. Immobility latency (C) and immobility time (D) in the FST were examined 24 h after administration of saline vehicle or ketamine. CMS mice administered saline showed a significant increase in immobility time compared with NS mice administered saline. However, administration of ketamine to CMS mice resulted in a significant decrease in immobility time compared with CMS mice administered saline. No significant between-group differences in immobility latency were observed. Results are the mean ± SEM; n=6. *P<0.05 was observed between NS+saline and CMS+saline and between CMS+saline and CMS+ketamine. The administration of antidepressants such as fluoxetine and imipramine has been reported to increase the number of BrdU-labeled cells, which indicates a stimulated proliferation of granule cell precursors, in the hippocampal DG . Therefore, we examined the effect of ketamine on the proliferation of granule cell precursors in the hippocampal DG in CMS mice. The number of BrdU-labeled cells in CMS mice administered saline was decreased compared with NS mice administered saline or ketamine (Figure 3). A single administration of ketamine partially but not significantly recovered the decreased number of BrdU-labeled cells in CMS mice (Figure 3). Thus, although ketamine did not affect the number of BrdU-labeled cells in CMS mice, it improved their depression-like behavior. Figure 3: The effect of ketamine on new cell proliferation in the hippocampal dentate gyrus (DG). CMS and NS mice were administered saline vehicle or ketamine (5 mg/kg, i.p.) once on the last day of 4-weeks-CMS or 4-weeks-NS. Photomicrographs showed 5-Bromo-2’-deoxyuridine (BrdU)-labeled cells in the DG of NS and CMS mice administrated either saline or ketamine. Scale bar: 100 m. The number of BrdU-labeled cells in CMS mice administered saline was decreased compared with NS mice administered saline or ketamine. A single administration of ketamine partially but not significantly recovered the decreased number of BrdU-labeled cells in CMS mice. Results are the mean ± SEM; n=6. *P<0.05 between NS+saline and CMS+saline, and **P<0.01 between NS+ketamine and CMS+saline. To examine the effect of short-term voluntary freewheel running on depression-like behavior, CMS and NS mice were allowed free access to a running wheel in their home cages for 3 days prior to the FST. For sedentary CMS and NS mice, the wheel was locked to prevent running. The total distance of both running CMS and NS mice over a 24-h period increased during the 3 days of voluntary freewheel access and reached about 3 km per 24 h at 3 days after starting running (Figure 4A). The running distance over a 24-h period during 3 days was not significantly different between running CMS and NS mice. The body weights of running CMS and NS mice were not significantly different from those of sedentary CMS and NS, respectively; however, a slight but significant decrease in body weight was observed in running CMS compared with running NS mice (Figure 4B). Figure 4: The effect of short-term voluntary freewheel running on depressive behavior. CMS and NS mice were allowed free access to a running wheel in their home cages for 3 days prior to the FST. (A) The total running distance over a 24-h period of both running CMS and NS mice increased during the 3 days of voluntary freewheel access and reached about 3 km in 24 h at 3 days after starting running. No significant differences were observed between running CMS and NS mice. Results are the mean ± SEM; n=5. (B) Body weight was measured after 3-day voluntary freewheel running. A slight but significant decrease in body weight was observed in running CMS compared with running NS mice. Results are the mean ± SD; n=8–11. *P < 0.05 vs. running NS mice. Immobility latency (C) and immobility time (D) in the FST were examined after 3-day voluntary freewheel running. Sedentary CMS mice showed a significant increase in immobility time compared with sedentary NS mice. 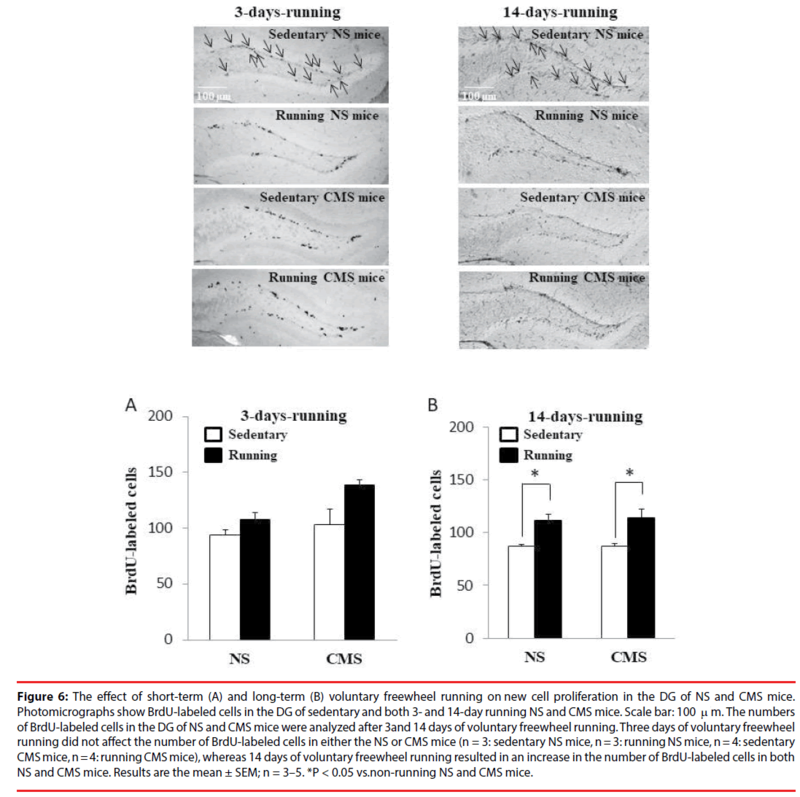 By contrast, 3-day voluntary freewheel running in CMS mice resulted in a significant decrease in the prolonged immobility time observed in sedentary CMS mice. Results are the mean ± SEM; n=6–11. *P<0.05 was observed between sedentary NS and CMS mice and between sedentary and running CMSmice. After 3 days of voluntary freewheel running, the FST was performed to assess depressionlike behavior. Sedentary CMS mice showed a significant increase in immobility time compared with sedentary NS mice. 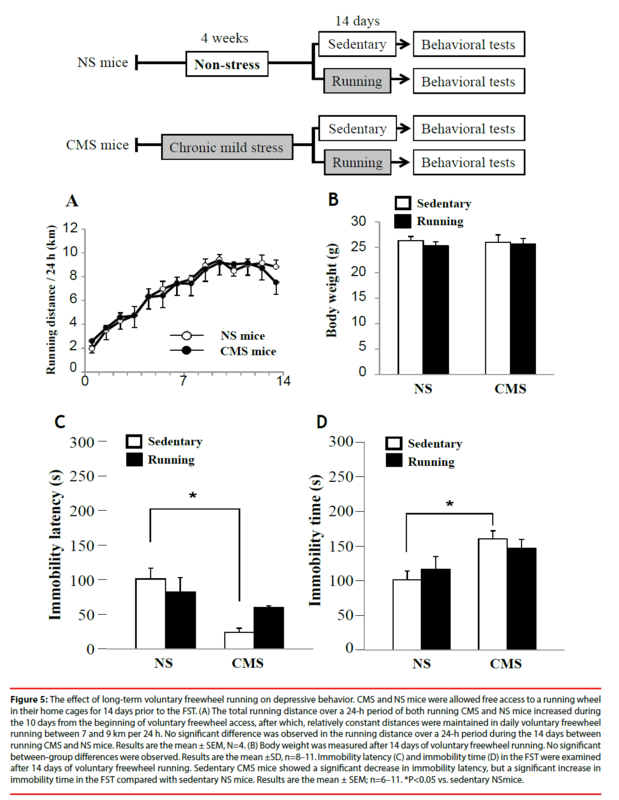 However, after 3 days of voluntary freewheel running, running CMS mice showed a significant decrease in immobility time compared with sedentary CMS mice, comparable to the levels observed in the running and sedentary NS mice (Figure 4D). On the other hand, no significant between-group differences were observed in immobility latency (Figure 4C). These results suggest that shortterm voluntary freewheel running improves depression-like behavior in CMS mice. To examine the effect of long-term voluntary freewheel running on depression-like behavior, CMS and NS mice were allowed free access to a running wheel in their home cages for 14 days prior to the FST. The total distance of both running CMS and NS mice over a 24-h period increased during the 10 days from the beginning of voluntary freewheel access. After 10 days, the mice maintained relatively constant distances in daily voluntary freewheel running between 7 and 9 km per 24 h. No significant differences were observed in running distances over a 24-h period during the 14 days between running CMS and NS mice (Figure 5A). In addition, no betweengroup differences were observed in body weight (Figure 5B). Figure 5: The effect of long-term voluntary freewheel running on depressive behavior. CMS and NS mice were allowed free access to a running wheel in their home cages for 14 days prior to the FST. (A) The total running distance over a 24-h period of both running CMS and NS mice increased during the 10 days from the beginning of voluntary freewheel access, after which, relatively constant distances were maintained in daily voluntary freewheel running between 7 and 9 km per 24 h. No significant difference was observed in the running distance over a 24-h period during the 14 days between running CMS and NS mice. Results are the mean ± SEM, N=4. (B) Body weight was measured after 14 days of voluntary freewheel running. No significant between-group differences were observed. Results are the mean ± SD, n=8–11. Immobility latency (C) and immobility time (D) in the FST were examined after 14 days of voluntary freewheel running. Sedentary CMS mice showed a significant decrease in immobility latency, but a significant increase in immobility time in the FST compared with sedentary NS mice. Results are the mean ± SEM; n=6–11. *P<0.05 vs. sedentary NS mice. After 14 days of voluntary freewheel running, sedentary CMS mice showed significantly increased immobility time and significantly decreased immobility latency in the FST compared with sedentary NS mice (Fig. 5C and D). However, after 14 days of voluntary freewheel running, CMS mice did not show any significant improvement in the depression indices in the FST (Figure 5C and Figure 5D). These results suggest that long-term voluntary freewheel running might have a less beneficial antidepressant effect compared with short-term running. Thus, the effect of voluntary freewheel running on depression-like behavior seems to vary according to the running term and/or distance, which depends on the difficulty of the exercise contents. Because adult hippocampal neurogenesis is decreased by CMS or depression, whereas chronic treatment with antidepressants has an ameliorative effect, it is thought to be involved in the pathogenesis of depressive diseases [10,11]. On the other hand, voluntary wheel running stimulates neurogenesis in the hippocampal DG via enhanced progenitor proliferation . However, those studies were conducted using intact mice. Therefore, we examined the effects of voluntary wheel running on new cell proliferation in the hippocampal DG in CMS mice. 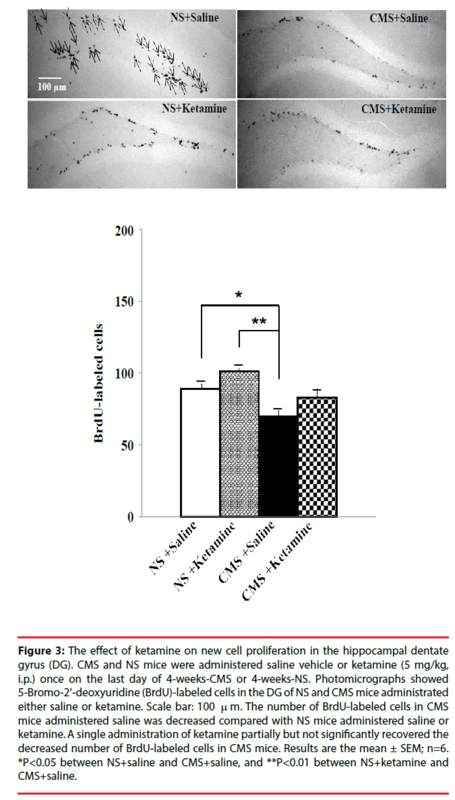 The number of BrdU-labeled cells in CMS mice 24 h after saline administration was decreased compared with NS mice administered saline or ketamine (Figure 3). However, CMS mice did not show any significant differences in the number of BrdU-labeled cells at 3 and 14 days after CMS exposure compared with NS mice (Figure 6A). The reason for the difference in the number of BrdU-labeled cells after CMS exposure remains unknown, but different experimental conditions, such as whether the cages are equipped with a running wheel and/or different time courses until analysis (24 h, 3 days, or 14 days after CMS exposure), may have had an effect. On the other hand, 3-day voluntary freewheel running did not affect the number of BrdU-labeled cells in either CMS or NS mice (Figure 6A). However, 14- day voluntary freewheel running resulted in an increased number of BrdU-labeled cells in both NS and CMS mice (Figure 6B). These results suggest that long- but not short-term voluntary freewheel running increases cell proliferation in the hippocampal DG. Our finding observed for 14 days of running is in agreement with that previously reported, in which voluntary wheel running stimulated neurogenesis in the hippocampal DG via enhanced progenitor proliferation . Figure 6: The effect of short-term (A) and long-term (B) voluntary freewheel running on new cell proliferation in the DG of NS and CMS mice. Photomicrographs show BrdU-labeled cells in the DG of sedentary and both 3- and 14-day running NS and CMS mice. Scale bar: 100 m. The numbers of BrdU-labeled cells in the DG of NS and CMS mice were analyzed after 3 and 14 days of voluntary freewheel running. Three days of voluntary freewheel running did not affect the number of BrdU-labeled cells in either the NS or CMS mice (n = 3: sedentary NS mice, n = 3: running NS mice, n = 4: sedentary CMS mice, n = 4: running CMS mice), whereas 14 days of voluntary freewheel running resulted in an increase in the number of BrdU-labeled cells in both NS and CMS mice. Results are the mean ± SEM; n = 3–5. *P < 0.05 vs.non-running NS and CMS mice. In the present study, we investigated the effects of two different terms of voluntary exercise, short (3 days)- and long (14 days)-term freewheel running, on depression-like behaviors and new cell proliferation in the hippocampal DG of mice exposed to CMS. The major findings were that short- but not long-term freewheel running exhibited an antidepressant effect without affecting new cell proliferation in the DG. Moreover, the antidepressant effect of short-term voluntary exercise in CMS mice was comparable to that of a single administration of ketamine. By contrast, long-term freewheel running did not improve depression-like behavior, but did stimulate new cell proliferation in the DG. Chronic stress is thought to be an important factor in DD , and CMS or depression has been reported to decrease neurogenesis in the hippocampal DG . By contrast, chronic treatment with antidepressants increases hippocampal neurogenesis, suggesting that antidepressants may be required to restore hippocampal neurogenesis to normal levels [5,10,11,14]. On the other hand, physical exercise has been reported to improve depressive symptoms effectively in DD patients , and voluntary wheel running in intact mice has been reported to reduce depression- and anxietylike behaviors [2,3]. However, only a few studies have examined whether voluntary wheel running improves depression- and anxiety-like behaviors observed in animal models of DD . Therefore, in the present study, to determine the appropriate degree of voluntary exercise to improve depression-like behavior and its relationship with new cell proliferation in the hippocampal DG, we examined the effects of two different terms of voluntary exercise, shortand long-term freewheel running, in terms of the difficulty of exercise contents on depressionlike behavior and the number of BrdU-labeled cells in the hippocampal DG using a DD animal model generated by exposure to CMS. Although long-term freewheel running increased new cell proliferation in the DG, it did not improve depression-like behaviors in CMS mice. In contrast to long-term freewheel running, short-term running showed an antidepressant effect similar to ketamine without affecting new cell proliferation in the hippocampal DG of CMS mice. These results imply that stimulation of new cell proliferation in the hippocampal DG might not beneficially contribute to the antidepressant effects of short-term voluntary freewheel running or a single administration of ketamine in CMS mice. However, further studies are necessary to provide understanding of the antidepressant effect of short-term freewheel running in CMS mice. Previous reports have shown that stress decreases hippocampal neurogenesis [13,15]. In the present study, we also found a decreased number of BrdU-labeled cells in CMS mice soon after CMS exposure (Figure 3). 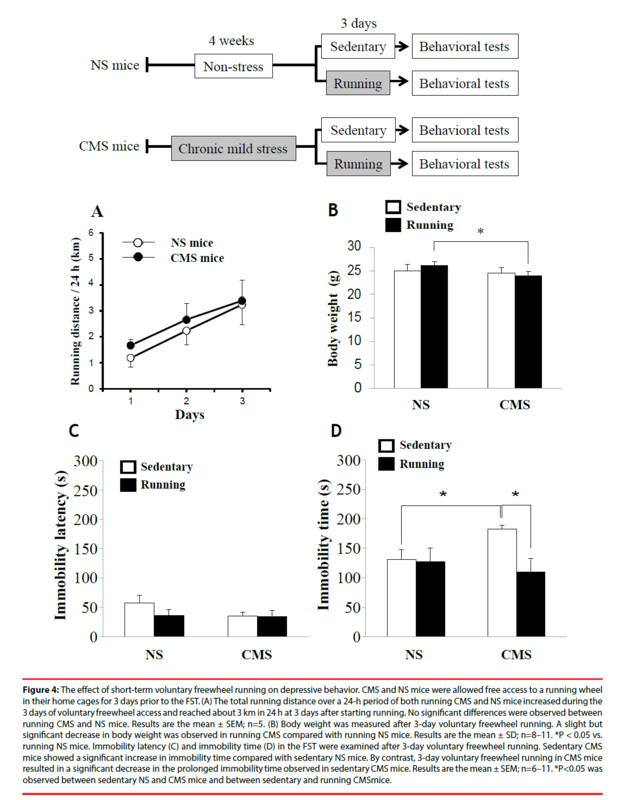 However, sedentary CMS mice did not show any significant differences in the number of BrdU-labeled cells at 3 and 14 days after CMS exposure compared with sedentary NS mice (Figure 6A). Because hippocampal neurogenesis can be influenced by various environmental factors and stimuli, this discrepancy may be attributable to different experimental conditions, such as whether the cages are equipped with a running wheel and/ or different time courses until analysis (24 h, 3 days, or 14 days after CMS exposure). Although chronic treatment with antidepressants has been reported to increase hippocampal neurogenesis [5,14], Bessa et al. (2009)  suggested that antidepressant actions do not depend on neurogenesis, but rather, are associated with neuronal remodeling in the hippocampus and prefrontal cortex. Thus, whether increased hippocampal neurogenesis is directly involved in the antidepressant effect or is secondary to the therapeutic effect on DD symptoms remains unclear. The findings from the present study suggest that voluntary exercise, unless taken to the point of exhaustion, could beneficially contribute to the recovery of depression-like behaviors, the effect of which is comparable to a single administration of ketamine, and thus may be appropriate for treating stress-related disorders such as anxiety and depression in animals and human. These findings could aid the maintenance of mental health in both animal and human without the need to depend on clinical medicine. However, further studies are required to elucidate the mechanism of the antidepressant effect of light voluntary exercise. We report that short- but not long-term voluntary exercise improves depression-like behavior in mice exposed to CMS in a comparable manner to ketamine, and that the effects of both short-term voluntary exercise and ketamine are independent of new cell proliferation in the DG. This work was supported by the President’s Discretionary Budget of Obihiro University of Agriculture and Veterinary Medicine (No. H27/2015) (to T.I. ), and by a Grant-in-Aid for Scientific Research (C) from the Japan Society for the Promotion of Science (to T.I.). Dunn AL, Trivedi MH, Kampert JB, et al. Exercise treatment for depression efficacy and dose response. Am. J. Prev. Med 28(1), 1-8 (2005). Duman CH, Schlesinger L, Russell DS, et al. Voluntary exercise produces antidepressant and anxiolytic behavioral effects in mice. Brain. Res 1199(1), 148-158 (2008). Salam JN, Fox JH, DeTroy EM, et al. Voluntary exercise in C57 mice is anxiolytic across several measures of anxiety. Behav. Brain. Res 197(1), 31-40 (2009). Tal-Krivisky K, Kronfeld-Schor N, Einat H. Voluntary exercise enhances activity rhythms and ameliorates anxiety- and depression-like behaviors in the sand rat model of circadian rhythm-related mood changes. Physiol. Behav 151(1), 441-447 (2015). Santarelli L, Saxe M, Gross C, et al. Requirement of hippocampal neurogenesis for the behavioral effects of antidepressants. Sci301(5634), 805-809 (2003). Hutton CP, Dery N, Rosa E, et al. Synergistic effects of diet and exercise on hippocampal function in chronically stressed mice. Neurosci308(2), 180-193 (2015). Adachi M, Barrot M, Autry AE, et al. Selective loss of brain-derived neurotrophic factor in the dentate gyrus attenuates antidepressant efficacy. Biol. Psychiatry 63(7), 642-649 (2008). Pennybaker SJ, Niciu MJ, Luckenbaugh DA, et al. Symptomatology and predictors of antidepressant efficacy in extended responders to a single ketamine infusion. J. Affect. Discord208(3), 560-566 (2017). Autry AE, Adachi M, Nosyreva E, et al. NMDA receptor blockade at rest triggers rapid behavioural antidepressant responses. Nature 475 (7354), 91-95 (2011). Duman RS. Depression: a case of neuronal life and death?. Biol. Psychiatry 56(3), 140-145 (2004). Brown J, Cooper-Kuhn CM, Kempermann G, et al.Enriched environment and physical activity stimulate hippocampal but not olfactory bulb neurogenesis. Eur. J. Neurosci 17(10), 2042-2046 (2003). Patten SB. Depressive symptoms and disorders, levels of functioning and psychosocial stress: an integrative hypothesis. Med. Hypotheses 53(3), 210-216 (1999). Lu M, Yang JZ, Geng F, et al. Iptakalim confers an antidepressant effect in a chronic mild stress model of depression through regulating neuro-inflammation and neurogenesis. Int. J. Neuropsychopharmacol. 17(9), 1501-1510 (2014). David DJ, Samuels BA, Rainer Q, et al. Neurogenesis-dependent and –independent effects of fluoxetine in an animal model of anxiety/depression. Neuron 62(4), 479-493 (2009). Could E, McEwen BS, Tanapat P, et al. Neurogenesis in the dentate gyrus of the adult tree shrew is regulated by psychosocial stress and NMDA receptor activation. J. Neurosci 17(7), 2492-2498 (1997). Bessa JM, Ferreira D, Melo I, et al. The mood-improving actions of antidepressants do not depend on neurogenesis but are associated with neuronal remodeling. Mol. Psychiatry 14(8), 764-773 (2009).